Every year, dogs suffer and die when their guardians make the mistake of leaving them in a parked car—even for “just a minute”—while they run an errand. 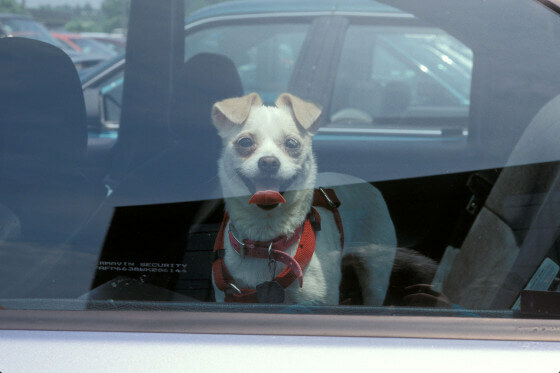 Parked cars are deathtraps for dogs: On a 78 degree farenheit / 25 degree celcuis day, the temperature inside a parked car can soar to 100*F / 38*C in just minutes, and on a 90-degree farenheit / 32 degree celsius day, the interior temperature can reach as high as 109*F / 43*C in less than 10 minutes. On an 87-degree day, asphalt temperatures can reach 140 degrees, hot enough to cause burns, permanent damage and scarring after just one minute of contact. Rapid burns and blistering can occur at 150 degrees. Hot sidewalks, pavement and parking lots can not only burn paws, they also reflect heat onto dogs’ bodies , increasing their risk of deadly heatstroke.